PAUL JAY, SENIOR EDITOR, TRNN: Based partly on what you’ve written, it seems that the more pressure the US puts on the Pakistan army to participate in the Afghan war and to deal with the al-Qaeda Taliban elements, the more it splits the army. How serious a division is there? SYED SALEEM SHAHZAD, PAKISTAN BUREAU CHIEF, ASIA TIMES ONLINE: There are several dimensions of this split. Number one, you have to appreciate the Pakistani military establishment supported the Taliban regime for the last–for five years from the middle to late ’90s and early 2000. So the thing is that they not only supported the Taliban regime, but they had also some agreements with the Taliban. And they had even the agreements with al-Qaeda before 9/11. JAY: In some of your articles you have mentioned the possibilities of even a kind of mutiny. Is that possible now? SHAHZAD: Well, it is quite possible. And if you remember, immediately after the 9/11, there were several attacks on then chief of the army staff and the president, Mr. Pervez Musharraf. And each of those attacks, there was a connection of Pakistani Armed Forces. In some cases there were southern Pakistan Air Force officials were involved. So you just cannot set aside the element of a limited mutiny in Pakistan army. There would certainly be a backlash, because you have to appreciate this fact, that Pakistan army has always been closely allied with Islamist forces. They had agreements with with the Taliban in the past when they were ruling Afghanistan, and they had even agreements with al-Qaeda when they were living in Afghanistan under the Taliban regime. They had, even, agreement with al-Qaeda, when Lieutenant General Mahmud, of the ISI, visited Kandahar after 9/11, and he met with the Taliban government. And he verbally assured Osama bin Laden that Pakistan would not mount any operation against al-Qaeda, they would not try to arrest them, and al-Qaeda would not, you know, retaliate against Pakistan, either. So, under the same very agreement, you know, Osama bin Laden and all the top al-Qaeda members were allowed to sneak inside Pakistan. And the crackdowns have mounted only in 2003, when Pakistani intelligence wrongly reported to General Pervez Musharraf that al-Qaeda was behind the attack on his motorcade in 2003. As a reaction, then Musharraf ordered a crackdown against al-Qaeda and all the jihadi organizations. And then, I mean, of course al-Qaeda also retaliated against the Pakistani military establishment and against Pervez Musharraf. So the thing is that the element of a limited revolt or mutiny within the Pakistan army is there, and you just cannot, you know, ignore that. JAY: Now, how has the broader sections of Pakistani public opinion reacted to the killing of bin Laden and what’s going on in terms of the controversy with the military and the ISI? I mean, what do–I know there’s no such thing as most Pakistanis, but in terms of the sort of majority of urban Pakistan public opinion, you could say, what do they think? SHAHZAD: The majority population of urban Pakistan are completely disillusioned with the Pakistani military establishment. They are least bothered about anti-Americanism. They are least bothered about al-Qaedaism. They are least bothered about Pakistan’s military role. But they do bother about two, three things. One is the economic meltdown in the whole country, the economic crisis in the country. They do bother about and they do concern about–on the question of Pakistan sovereignty, which is under siege from all sides, not only from the American side, but also from the militant side. I mean, they are very much concerned that Pakistan has turned into a proxy battleground by all sorts of forces, not only from the al-Qaeda side and the American side, but also Iranians and the Saudis are very active inside Pakistan, and they are paying money to different groups in different militant outfits to settle the score against each other. So the thing is, they are completely disillusioned with everybody, and they are looking for some new leaders who would, you know, take the country out of the crisis, of economic crisis, of the political crisis. And the issue–and the identity crisis. Pakistan’s identity crisis, that what is Pakistan is really up to. Is it a republic? Is it an Islamic Republic? Is it democratic state? Or what? So they are actually–they’re completely disillusioned with the situation. JAY: Now, just let me ask you one final question, which I haven’t asked you before. The 9/11 attacks themselves, if in fact they were organized from bin Laden and al-Qaeda, and he was in Afghanistan but he was closely tied to at least elements, if not important sections, of the leadership of the Pakistan military and intelligence, clearly bin Laden was closely connected with sections of the Saudi royal family. Has there ever been an inquiry or a call for an inquiry into what was behind 9/11 and whether or not Pakistan or Saudi intelligence played any role in it? 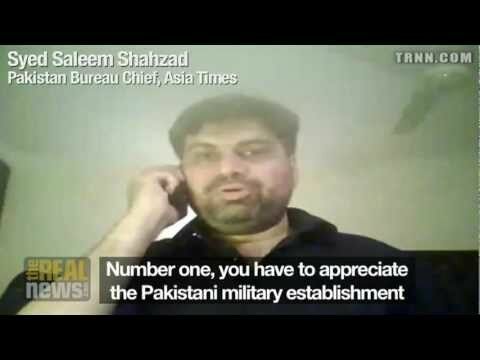 SHAHZAD: You have to appreciate two things when you would investigate the 9/11 plot. Number one, the broader ideas. The broader ideas actually came from Dr. Ayman al-Zawahiri, who actually wanted a friction between the West and the Muslim world on very broad lines. And for that, he actually wanted a flashpoint to be created. And the second element was Khalid Sheikh Mohammed. Khalid Sheikh Mohammed was not al-Qaeda’s member. He was a standalone jihadi. And he came up with this idea of 9/11. And then he proposed that idea to Dr. Ayman al-Zawahiri and Osama bin Laden. Ayman al-Zawahiri was the most happy person. And if you study Dr. Ayman al-Zawahiri’s personality, you would be knowing that he is a silent manipulator. He cunningly manipulated Osama bin Laden’s mind, and that way he made sure that 9/11, like, even would happen in America, but because it would guarantee a massive friction in the world, and massive polarization in the world, and would divide the world on ideological lines, and that is what he was precisely looking for. So I don’t think that there is any question of the Saudi involvement, Saudi establishment’s involvement or the Pakistani military establishment involvement. No matter how close they were to the Taliban or Osama bin Laden or any other personality–even Osama bin Laden was very well manipulated by Dr. Ayman al-Zawahiri. JAY: There certainly was some evidence of connections between the Saudi royal family. There was a document from a congressional investigation that the LA Times reported on, that there were at least individual members of the Saudi royal family that have helped to finance certain members of the 9/11 participants. Has this ever been actually investigated or looked into within Pakistan? Because as you’ve–you’ve reported yourself that the ISI and military had very close connections with al-Qaeda before 9/11. SHAHZAD: There were proofs, there were evidence of financial linkages between the Taliban and al-Qaeda and the Saudi royal family, and even within the Pakistani military establishment. But, actually, those linkages were presented larger than the life. Most of that financial assistance was meant for the NGOs which were operating in Afghanistan. And several royal family members donated the funds to those NGOs. But it was presented in a different light, in a different angle, as the royal family donated the money, royal family members donated the money to al-Qaeda for launching 9/11 operation. So that was–I don’t, you know, give much break to those evidences. Al-Qaeda is completely an anti-establishment and anti-state element. And this is the same for the whole world. Al-Qaeda is not loyal to any single state of the world. So I don’t subscribe, actually. JAY: Okay. Just one thing, finally, then. The Americans have positioned the death of bin Laden as a possible opening for negotiations with the Taliban, that now the Taliban can separate itself from al-Qaeda and there’s some kind of a process that can now be negotiated. Do you think there’s any merit to that argument? SHAHZAD: I don’t think so. I don’t think so. They are grieving, actually. Number one, they underestimated the–or you can say they have wrongly interpreted Taliban’s sentiments. Taliban, whether they are different from al-Qaeda or they have differences from al-Qaeda on strategy and maybe on the ideology, but they are very courteous people. And since Americans have assassinated Osama bin Laden, this is no occasion for the Taliban that they would ditch al-Qaeda and they would switch to Americans. It is quite possible that after five, six years, after many years, they would behave differently. But on this particular occasion, on this particular occasion, I don’t think that Taliban would behave in a friendly way towards Americans. I don’t think so. JAY: Alright. Thanks very much for joining us, Saleem.